For our first proper jolly this year, Nigel Stringer and I went today (25/5) to the Rhandirmwyn area, followed by a quick visit to some woodland near Cilycwm. At the disused lead mine site at Nant y Mwyn, I flushed quite a lot of Ancylis unguicella from dry, heathery banks, a species new to me and with only seven previous Carmarthenshire records ( and even fewer in Glamorgan). 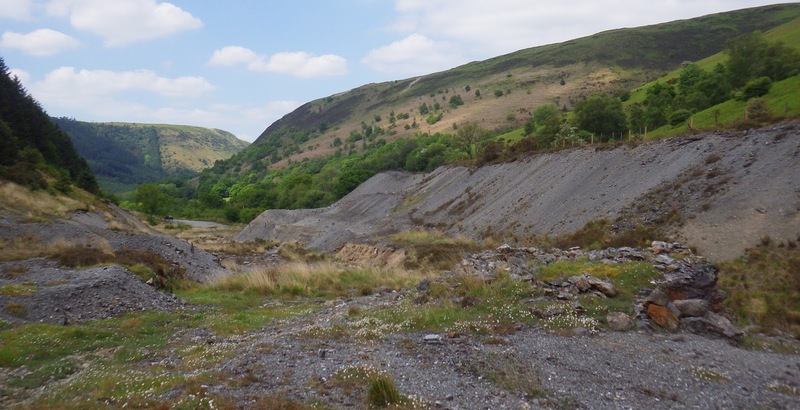 A few other (common) micros were recorded at this site and also later at the Nant y Rhaeadr conifer woodland block (where we took the wrong path, which meant that we did n`t reach the intended upland outcrops). A beautiful snout was swept from bilberry, but it would n`t stay still for a decent photo. Above: spoil tips and shingle at the old lead mine site. Above: Ancylis unguicella. Thanks to George for confirming the i/d.